Hayes is a founder of the Operations Strategy field, and all four authors are on the Harvard Business School faculty. 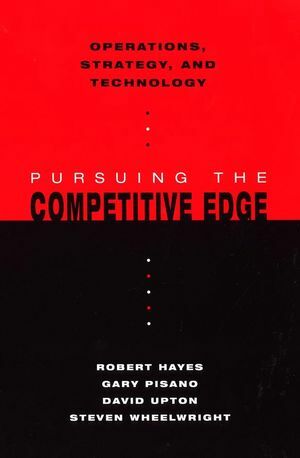 In Operations, Strategy, and Technology: Pursuing the Competitive Edge--the long-awaited follow-up to the highly successful classic, Restoring Our Competitive Edge--Bob Hayes, Gary Pisano, Dave Upton, and Steve Wheelwright take a fresh look at the foundations of corporate success. This book addresses the basic principles that guide the development of a powerful operations organization, and describes how a company's operating and technological resources can be applied to create a sustainable competitive advantage in today's "new" (global and IT-intensive) economy. Achieving a competitive advantage through superior operations is what the authors refer to as the "operations edge." ROBERT H. HAYES is the Philip Caldwell Professor of Business Administration, Emeritus, at the Harvard Business School. He has published widely; three of his articles won McKinsey Awards for the best articles published in the Harvard Business Review during those years. His latest book, Strategic Operations: Competing Through Capabilities (coauthored with Gary Pisano and David Upton ), was published in 1996. GARY P. PISANO is the Harry E. Figgie, Jr. Professor of Business Administration at the Harvard Business School. Since joining the Harvard faculty in 1988, he has taught both MBA and executive level courses on technology and operations management, operations strategy, competitive strategy, product development, the management of innovation, and health care. Pisano is a widely published author with over 25 research papers published in such journals as Management Science, Administrative Science Quarterly, and the Harvard Business Review. He has also written case studies on such companies as BMW, ITT-Automotive, Intel, and Eli Lilly. DAVID M. UPTON has been on the faculty of the Harvard Business School since 1989. He is currently course head for the required first-year MBA course in Technology and Operations Management and has taught second-year elective courses in Operations Strategy and Operations Improvement and Information Technology. STEVEN C. WHEELWRIGHT is the Edsel Bryant Ford Professor of Business Administration, Retired, at Harvard Business School. Along with Harvard colleagues Bob Hayes and Kim Clark, Professor Wheelwright has also published the highly regarded book, Dynamic Manufacturing: Creating the Learning Organization (Free Press, 1988). 1. Operations Management Confronts a New Millennium. 2. Operations Strategy: Origins and New Directions. 4. Determining Organizational Boundaries: Vertical Integration and Outsourcing. 5. Designing and Managing Operating Networks. 6. Information Technology and Operations. 7. Creating an Edge Through New Process Development. 8. Creating an Edge Through Superior Project Management. 9. Evaluating and Justifying Capital Investments. 10. Sharpening the Edge: Driving Operations Improvement. 11. Guiding the Pursuit of an Operations Edge. Focuses on the basic principles that create the foundation for an organization's operational success and describes how to strategically manage operating and technology resources. Provides an overall framework for thinking about the management of a firm's operations function, rather than specific tools and techniques. Addresses key topics such as corporate networks, information technology, process development, project management, and different ways of managing operating improvement. Provides the latest thinking on operations strategy, capacity planning, and outsourcing/vertical integration, based on the latest academic research and corporate experience. Includes examples in manufacturing and services, including Intel, Yahoo, McDonalds, and Dell.